Aurangabad is an important city in the state of Maharashtra, India. It sees a lot of international tourist traffic due to world heritage sites, Ajanta & Ellora caves. Aurangabad, a dream destination of Mughal Emperor Aurangzeb, founded in 1610, is known today, as one of the four important cities in Maharashtra. The city is heading towards rapid industrial growth, but retains its past glory and charms, heritage and traditions. Conspicuously seen on the Deccan plateau, it has a rich culture and a plethora of magnificent arts on display. Travellers to Aurangabad will find history dating back to the 2nd century BCE, when the Satavahana rulers established their capital in Pratishtanapura, today known as Paithan. It was around this time that the viharas (monasteries) were carved out of caves in what is now Ajanta, and the stunning cave paintings were made, to be lost and rediscovered in the early 19th century. The carvings in the Ellora caves track the changing fortunes of three major religions Buddhism, Hinduism and Jainism between the 5th and the 10th century CE. The Yadava kings established their capital in Devagiri (also spelt Deogiri) and built a fort that stands to this day. The fort was reputed to be impregnable, but Ala-ud-din Khilji of Delhi captured it by laying siege on it and renamed it to Daulatabad. Malik Kafur, his general consolidated his hold on the region. As the Delhi Sultanate was captured by Mohammad bin Tughluq, the fort passed to him. Tughluq is famous for his famously botched plan to move his capital from Delhi to Daulatabad along with the entire population of the city, only to have to return because he had not planned for water supply at his new capital. This fiasco ensured fame for his name, as Indians took to describing the oft-shifting plans of their rulers as "Tughluq policies". Aurangabad then fell to the local Muslim rulers of Deccan who revolted against the Delhi Sultan. The city of Aurangabad was founded by Malik Ambar, the Prime Minister of one of these rulers, though the name of the city then was Fatehpura. The region kept changing hands till the Mughal Emperor Shah Jahan consolidated his hold and appointed his son Aurangzeb as the governor. Aurangzeb established his base here. He returned to the city again in 1681, this time as an emperor, determined to crush the south once and for all. He spent the last two decades of his life battling the Marathas in an ultimately fruitless campaign. He died in 1707 in Khuldabad near Aurangabad city and was buried there — the battles ultimately resulted in the demise of his empire too. The district is now the headquarters of the backward region of Marathwada, but it is also a manufacturing hub as many Indian companies have their plants here. It also contains the headquarters of Videocon, a fairly large Indian MNC. Aurangabad has a long association with the concept of heritage. Aurangabad has seen several dynasties and experienced the power of rulers of different religions, cultures and communities, each of which has left its mark on the city. The city of Aurangabad was founded in 1610 by Malik Amber, the prime minister of Murtaza Nizam Shah II. The town was named as ‘Khirki’ and was stated a capital. The town started growing. Aurangzeb when he became Viceroy of the Deccan plateau made it his capital and named it Aurangabad. This was the golden time in the history of Aurangabad when the city flourished the most in terms of culture, architecture, art etc. In the year 1679, Aurangzeb’s son built a replica of the Taj-Mahal, the ‘Bibi-ka-Maqbara’, in tribute to his mother Begam Rabia Durani. It is considered to be a masterpiece of Mughal architecture in the Deccan plateau. The entire city of Aurangabad was fortified and huge entrance gates were erected. Except for Bharkal gate all the other gates are associated with the period of Aurangzeb. The gates with prime importance were the ones facing the four directions, Delhi Gate facing the North, Paithan gate facing South, Makai Gate (Mecca Gate) facing East and the Khas Gate facing the West. In all there were 54 gates in Aurangabad. Out of 54 gates only 13 have survived over the period of time. The important and Architecturally most appealing gates include Delhi Gate, kala Darwaza, Makai Gate, Paitahn gate and Rangeen Darwaza. Aurangabad like any other part in India experiences three major seasons viz. Summer, Winter and Monsoon. Summer is observed from March to May with an average maximum and minimum temperatures of 37 and 21 Degrees Celsius respectively. The hottest summer temperature is around 45°C but never goes above that. Nights are usually pleasant and cooler during the entire summer. Average Relative Humidity is as low as 9%. Winter is seen from November to February which is the most comfortable time to visit Aurangabad. The average winter temperature ranges from a maximum of 22°C to a minimum of 10°C. As it gets cooler the mercury even touches 7°C but that is the lowest usual temperature. Just like summer the nights are cooler in Aurangabad. Average Relative Humidity is 17%. Monsoon which ranges from June to October receives moderate rainfall of 91 cm on an average. The average relative humidity during this period of time is 40%. Major population in Aurangabad speaks Marathi- the regional language of Maharashtra. Hindi, Urdu and English are also spoken widely. Generally people who come in contacts with tourists do understand and speak fairly good English. Aurangabad is well connected by air, rail and road to other parts of country. Aurangabad enjoys a central location with respect to Maharashtra and Goa. All major cities in Maharashtra lie within a radius of 500 Km. Aurangabad has a good network of national and state highways connecting all parts of the country. Aurangabad railhead is directly connected to many parts of the country including major cities like Delhi, Mumbai, Pune, Hyderabad. Direct flights from Mumbai and Delhi are available on a daily basis. One flight from Udaipur is also available (except on Mondays) during tourist seasons. Aurangabad has its own International airport. A new airport terminal building was inaugurated on Nov. 21,.2008 on the outskirts of the city. Chikalthana Airport is equipped with all the modern facilities (airport code: IXU). Air India has regular flights from Mumbai, Delhi and Hyderabad to Aurangabad. The nearest international airports are Mumbai and Pune. The first Boeing 747 (one of the largest commercial aircraft till date) landed in Aurangabad in 1974. Many war planes of the Indian Air Force refuel at the Chikalthana airport. Air Vistara, Indigo and TruJet operate flights from Delhi to Aurangabad via Mumbai/Hyderabad. Air India operates flights from Udaipur to Aurangabad via Mumbai. A lightweight briefcase not exceeding 300 cubic cm is not included, but carries a INR-5 surcharge. No receipt is given by the porters. You can tip the porters up to INR-5 if you desire. Trains are quite comfortable and a fairly fast mode of transport. They are ideal for long and short hauls in India, as they are extremely cheap and affordable. The difference between a lowest-fare air-ticket and the highest class train fare is remarkable. E.g. The highest fare (Air-conditioned First Class Overnight Sleeper) for Mumbai - Aurangabad travel (around 375 Km) is only about INR-1050/-, or INR-420/- for an air-conditioned Chair Car in a superfast Janshatabdi for a day journey of 6 1/2 hours, while the lowest air-fare of any low cost Airline, starts from around INR.3500/-! Indian Railways offer various options including air-conditioned compartments like air-conditioned First Class (railway code 'H'), air-conditioned 2-Tier Sleeper (railway code 'A'), air-conditioned 3-Tier Sleeper (railway code 'B'), and for day trains air-conditioned Chair-Cars (railway code 'C'). IRCTC provides complementary blankets, pillows and hand towels on all air-conditioned sleeper class compartments (H, A & B). Apart from this reserved non air-conditioned sleeper class (railway code 'S') and Second Class Seating (railway code 'D') are available on all sleeper trains and seating trains respectively. Mumbai, Dadar, Thane, Kalyan, Igatpuri, Dewlali Cantt., Nasik, Lasalgaon, Manmad, Aurangabad, Jalna, Parbhani, Nanded. Mumbai, Dadar, Thane, Kalyan, Nasik, Manmad, Aurangabad. Mumbai, Dadar, Thane, Kalyan, Igatpuri, Dewlali Cantt., Nasik, Lasalgaon, Manmad, Aurangabad, Jalna, Parbhani, Nanded, Adilabad, Wani, Sevagram, Nagpur. Mumbai, Dadar, Thane, Kalyan, Igatpuri, Dewlali Cantt., Nasik, Lasalgaon, Manmad, Aurangabad, Jalna, Parbhani, Nanded, Dharmabad, Basar, Nizamabad, Secunderabad. Amritsar, Jallandher, Ludhiana, Ambala Cantt., Panipat, New-Delhi, Mathura, Agra, Gwaliar, Jhansi, Bhopal, Itarsi, Khandwa, Bhusawal, Manmad, Aurangabad, Jalna, Parbhani, Nanded. Secunderabad, Nizamabad, Dharmabad, Nanded, Parbhani, Jalna, Aurangabad, Manmad. Secunderabad, Nizamabad, Dharmabad, Nanded, Parbhani, Jalna, Aurangabad, Manmad, Lasalgaon, Nasik, Dewlali Cantt., Igatpuri, Kalyan, Thane, Dadar, Mumbai. Rail links via Manmad Junction: Manmad is the nearest railway junction on Central Railway wherein trains to all parts of India are available. Manmad - Aurangabad journey can be made by a good connection of trains or by road in a span of 2 to 2 1/2 hours. If you have a connecting train, make sure that there is at least a gap of 2 hours in the departures. In case you miss the connecting train, due to late running of a previous train, you can avail of a full refund at any of the two stations (i.e. connecting station or destination station). Aurangabad is linked by national highways and state highways to all parts of the country. Aurangabad has excellent road connectivity to all important cities in Maharashtra, namely Mumbai, Nagpur, Pune, Nasik etc.. The highway connections make the journey to the world famous destinations of Ajanta and Ellora very comfortable. Mumbai – Aurangabad: 400 Km. Pune - Aurangabad: 237 Km. Nasik – Aurangabad: 190 Km. Shirdi – Aurangabad: 144 Km. Ajanta – Aurangabad: 107 Km. Ellora – Aurangabad: 29 Km. Daulatabad – Aurangabad: 14 Km. From Mumbai - Aurangabad can be reached by road from Mumbai via Pune or Nasik. The best option if you can not afford flights is train though. Via road Pune is a faster option despite a bit longer distance. MSRTC (Maharashtra State Road Transport Corporation) and private buses ply regularly and is an overnight journey. MSRTC operates their premium world class Airconditioned Volvo B7R Bus service on this route named 'Shivneri'. A few recommended private buses from Mumbai would be Royal Cars(AC), Konduskar(AC), Ghatge Patil-Snozzer (AC Sleeper), Humsafar (Non AC budget carrier). Book your tickets only from authorized travel agents in Mumbai. A sinlge ticket on Air-conditioned bus is from INR-450/- to INR-650/-, Air-conditioned sleeper bus is from INR-700/- to INR-850/-, and for budget Non Air-conditioned buses is INR-250/- to INR-350/-. Do not pay any agent more than this. From Pune if you do not wish to drive then the safest and most reliable option is an MSRTC (Maharashtra State Road Transport Corporation) Shivneri Air-conditioned Bus Service. The fleet consists of all Volvo B7R-9400 buses and are extremely safe, comfortable and fast. MSRTC Shivneri buses depart every hour from Shivajinagar Bus Stand starting from early morning 6.00 AM till late night up to 1.00 AM. For budget travellers, an award winning Non Air-conditioned semi luxury bus service Asiad, also operated by MSRTC is available. Asiad buses depart every half an hour from Shivajinagar Bus Stand starting from early morning 5.00 AM till late night up to 1.00 AM. These are non Air-conditioned but comfortable buses. Avoid taking Air-conditioned and Non Air-conditioned private Buses. They never leave and reach on time! From Nasik there is a similar semi luxury Asiad bus service of MSRTC (Maharashtra State Road Transport Corporation) with semi luxury Asiad buses available every hour departing from Nasik Central Bus Stand (CBS). From Nagpur also Aurangabad has also a good road connectivity. If you are traveling by bus, it will take you a bit more than 12 hours. MSRTC (Maharashtra State Road Transport Corporation) operates semi luxury - Asiad and ordinary buses to Aurangabad from Nagpur. Private AC Volvo and Non AC luxury buses are also available on local basis. Good carriers include Prasanna(AC), Saini(AC) and Saini(Non AC budget carrier). Apart from these cities Aurangabad has direct bus links from cities like Hyderabad, Solapur, Kolhapur, Goa, Ahmedabad, Indore and many more. The city of Aurangabad has all forms of transport right from intra-city buses, metered auto-rickshaws to chauffeur-driven taxis. Intra-city Bus service is Municipal Corporation owned but privately operated. AMT (Aurangabad Municipal Transport) buses ply throughout the city and outskirts reaching thousands of citizens to their offices, schools, colleges efficiently and in a cost effective manner. MSRTC (Maharashtra State Road Transport Corporation) buses connect Aurangabad to nearby tourist places, distant suburbs and villages around. As a tourist one is recommended to either take Metered Auto-rickshaws (3-wheeler taxis) or Chauffeur driven Taxis. These taxis are not very expensive and are ideal for one day tours to Ajanta, Ellora, Daulatabad, etc. A hatchback type air-conditioned taxi will cost you around INR 7.00/- per kilometer for a least count of 80 KM or 8 hours whichever is less. Rates of more premium taxis are also computed in same manner with a higher cost per KM. Although Aurangabad has Metered Auto rickshaws(Three wheeler taxis) which run based on the fare as shown in Meter (details given below), it is seen that like any other tourist place Auto rickshaw drivers ask for exorbitant rates from the tourists especially at Railway station, Central bus stand or stops of Private buses. Make sure to ask before boarding the three wheeler cab that he will be charging you based on the meter reading, he activates the meter when you board, he has a certified tarif card. The actual fare around 10 times the meter reading in INR. But you can pay him around 12 times the reading. A tip up to 10% of the fare may be given ONLY IF you are happy with his services. Mid night fare is applicable from 00.00 hrs. to 05.00 hrs. which is 1.5 times the usual fare i.e. around 15 times the meter reading. Around half hour consideration can be given to auto rickshaw drivers (23.30 hrs to 05.30 hrs) as given by a majority of residents of Aurangabad. AMT (Aurangabad Municipal Transport) intra-city buses ply throughout the city including the outskirts and connect different parts of the city and adjoining suburbs together. The AMT bus service is affordable and thus masses use it for their daily transport. AMT buses carry thousands of passengers to and fro their workplaces, schools & colleges daily and thus are quite crowded during morning and evening rush hours. Tourists who wish to travel to Ajanta, Ellora, Daulatabad, Paithan or any nearby tourist place are STRONGLY RECOMMENDED to travel only in MSRTC (Maharashtra State Road Transport Corporation) buses from Aurangabad CBS (Central Bus Stand), if they have not hired a Chauffeur driven Taxi from an authorised agent. Do remember that it is worthwhile to wait some time for an MSRTC bus than travelling in maxi-cabs (medium sized black-yellow taxis) parked outside the Aurangabad CBS (Central Bus Stand). These taxis are extremely unsafe. Aurangabad depot of MSRTC (Maharashtra State Road Transport Corporation) was crowned as Number One in Maharashtra in terms of the passenger flow and revenue generation for the year 2007-08. Aurangabad Bus depot is also the depot operating maximum number of 'Janata Bus routes' (public buses which halt at every stop particularly connecting the small villages and localities around the nearest big city) to and from the smaller towns nearby. In general, public transport in and around the city is fairly good. MSRTC (Maharashtra State Road Transport Corporation) and ITDC (India Tourism Development Corporation) operate daily conducted tours by semi-Luxury buses to the tourist destinations like Ellora, Ajanta and Daulatabad wherein they also take a note of the tourist destinations in the city. These journeys can be booked at Aurangabad Central Bus Stand (CBS). These conducted bus tours are ideal only if you are short of time and are alright having a glance at all these places. The major disadvantage of these tours is a very tight time-schedule. The sightseeing has to be wound up very fast without you being able to take your own time. Metered Auto-Rickshaws are undoubtedly the most suitable and convenient way of traveling through the city. This is due to their easy availability at any time and the affordability. These are hired three-wheeler taxis which are ideal to move around the city. The Meter reading is read along-with a 'tariff-card' available with the driver. The actual fare is usually around 10 times the meter reading. Always ensure that the driver starts the meter on beginning of the journey. Fare from Mid night 12:00 AM to 05:00 AM is One and Half times the regular fare. The minimum regular fare is as low as INR 12/- Only. These are ideal for the tourists visiting the city and the tourist destinations around. The tourist taxis can be booked from various travel agents in the city like Blue-Ocean travels,Wonder, Manmandir, Saibaba, Welworth, Classic Cars, etc. All hotels also have a taxi-counter. The fare is calculated per kilometre with a minimum of 80 KM. The fare depends on the class of vehicle and the type (AC or Non-AC). See to it that the taxi you hire has a tourist permit and is not a private vehicle. The tourist permit cars can be easily identified by a yellow number plate. This is the most common way of transport for the local people. But for the tourists, self driven cars and two wheelers are not easily available on hire basis in India. Driving on the streets is fairly comfortable as there is not much traffic on the roads and the roads are wide (except that in old part of the city). Some roads are not very well-maintained and are prone to pot-holes. 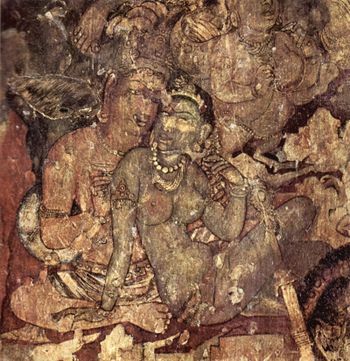 The Ajanta Caves depict the stories of Buddhism spanning from the period from 200 B.C. and 650 A.D. These caves were discovered in the 19th century by some British Officers who had been on a tiger hunt.These 29 caves were built by Buddhist monks using simple tools like hammer & chisel. These caves were the retreats of Buddhist monks who taught and performed rituals in the Chaityas and Viharas, the ancient seats of learning. The elaborate and exquisite sculptures and paintings depict stories from Jataka tales. The caves also house images of nymphs and princesses.The Ajanta caves and the treasures they house are a landmark in the overall development of Buddhism as such. The Ellora (Verul) Caves have been Carved during 350 A.D. to 700 A.D. these structures represent the three faiths of Hinduism, Buddhism and Jainism. These caves 34 in number are located 29 km. from Aurangabad. They are fascinating and the finest example of cave temple architecture housing elaborate facades and exquisite interiors. The 12 caves to the south are Buddhist, the 17 in the centre dedicated to Hinduism, and the 5 caves to the north are Jain. The nobility, grace and serenity inherent in Buddha is reflected in the sculptures of these caves. Caves 6 and 10 house images from the Buddhist and Hindu faith, under the same roof, the latter dedicated to Vishwakarma, the patron saint of Indian craftsmen. The Vishvakarma cave is both a Chaitya and a Vihara, with a seated Buddha placed in the stupa. Its two - storeyed structure sports a colourful pageant of dwarfs, dancing and making music.The Kailasa temple in Cave 16 is architecture. The entire structure was a exquisite piece carved out of a monolith, the process taking over a century to finish. This mountain - abode of Lord Shiva, is in all probability, the world's largest monolith, the gateway, pavilion, assembly hall, sanctum and tower, all hewn out of a single rock. The most striking feature about this structure is that unlike other temple structures that are built base onwards, the sculptures or architects of this majestic and fantastic sculptures started carving from the very top and the sides. The gigantic yet delicate and intricate piece of ancient work is the most amazing structure here. The Dumar Lena cave, dedicated to Lord Shiva, resembles the famous cave temple of Elephanta. The Jain caves are about a mile away from the Kailasa temple, amongst which Cave 32, houses a beautiful shrine adorned with fine carvings of a lotus flower on the roof, and a yakshi on a lion under a mango - tree, while Caves 32 and 34 contain grand statues of Parasnath. The other Jain caves sport the images of Tirthankaras, and one of them, also, has a seated figure of Mahavira.These caves are a treasure of India which hold the wealth and display the rich Indian heritage.Festival: Every year in the third week of March, M T D C organizes the Ellora Festival of Classical Dance and Music at the caves. Ghrishneshwar temple is half a kilometer from the Ellora Caves, and 30 km from Aurangabad. It is an 18th century temple that presents outstanding architecture and carving. This place forms one of the five Jyotirlinga sites in Maharashtra where Lord Shiva is worshipped. The Holkar temple nearby is a must-see. Daulatabad Daulatabad, earlier known as Devgiri, is situated at a distance of 13km from Aurangabad. Also termed as the city of fortune, it houses a stupendous 12th century fortress well placed atop a charming hill. This invincible fortress boasts of a 5 kilometer sturdy wall and an intricate series of ramparts. Don't miss the climb to the very top through the bat cave. Bibi ka Maqbara A replica of the Taj Mahal, the Bibi-ka-Maqbara is the only example of Mughul architecture of its kind in the Deccan plateau. It was built in 1679 by Aurangzeb’s son, in tribute to his mother, Begum Rabia Durani. It lies in the city of Aurangabad itself. Panchakki Pan Chakki is a 17th century water mill. The name has been derived from the mill that crushed grain for the pilgrims. There is a picturesque garden here that houses several beautiful fish tanks and it plays abode to the memorial of a Sufi Saint. Aurangabad Caves, a fine piece of architecture, is presented in the most unembellished manner. The caves lie just outside the city and are believed to have been excavated between the 2nd and the 6th century. They house the most stunningly intricate carvings. There are nine caves in all, most of them being the viharas. The 4th and the 7th cave are worth a look. The 4th cave stands well supported on 12 columns carved with scenes depicting the stories from the Jataka tales, whereas the 7th cave is embedded with carvings of women, adorned with jewels. The main attraction is the sculpture of a 'Bodhisatva' praying for deliverance. Also, the views of Aurangabad from the caves make it worth a trip. One can see the Bibi-ka-Maqbara almost from the air. Soneri Mahal, an old historic monument now converted into museum houses a variety of ancient Indian pottery, dresses, remains of local palaces and antiques of daily use. A number of sculptures and reliefs from the local excavations are also on display. It is located within Dr. Babasaheb Ambedkar Marathwada University Campus and is on the way to Aurangabad caves. History Museum - Dr. Babasaheb Ambedkar Marathwada University also located on the University campus has on display a good number of ancient Indian paintings, coins, fabrics, arms, artifacts, etc. The museum collection is huge and has some fine sculptures from the excavation at Bhokardan, a nearby historic site. Chatrapati Shivaji Museum - As the name suggests, this museum is dedicated to the great warier of Maharashtra - Chatrapati Shivaji Maharaj. A number of exhibits associated with Lord Shivaji are on display. The museum is on the way to Ajanta caves from the city. Lonar - This is site of a meteor which crashed on earth some 50,000 years ago and formed a large crater (few hundred meters in diameter) in the ground. Paithan is an ancient Taluka town, which lies 56 km to the south of Aurangabad. This place is well known for the exquisite saris that it specialises in. It was a trade centre earlier and also the capital of the Satavahanas. MSSIDC (Maharashtra Small Scale Industrial Development Corporation) has a weaving centre where the traditional art is still practiced. It has formed an important excavation site recently. Of the few nearby attractions, the Jayakwadi dam is a treat to the eyes of the avid bird watchers. Next is the Dnyaneshwar Udyan, which is supposedly Maharashtra's largest garden planned and landscaped on the lines of the Vrindavan gardens at Mysore. Gautala Wildlife Sanctuary is a dense forest reserve, with rare flora and fauna, almost 70 Km. Northwest of Aurangabad. Home to leopards, bears, wolves, hyenas, jackals, flying squirrels and 85 different species of colourful birds. Pitalkhora lies peacefully nestled in the Satmala ranges of the Sahyadris, at a distance of 78km from Aurangabad. There are 13 cave sanctuaries embedded in this region. These monasteries date back from 2nd century BC to 5th century AD. Rich carvings with elaborate details can be seen in these monuments. WARNING: The side road to reach Pitalkhora from the main Aurangabad road is in bad shape. Don't go unless you have a SUV/Tata Sumo type of vehicle. The caves are reachable via a footbridge that is in a very bad shape. There is little to see in the caves except for half-finished carvings. Siddharth Garden is a beautiful landscaped garden, with good variety of trees and shrubs. There is a small aquarium inside the garden, however the biggest attraction is the Siddharth Garden Zoo, with a large variety of animals, viz. Lions, tigers (White & Bengal), leopards, crocodiles, snakes (Snake-house), civet cats, hyenas, foxes, porcupines, Emu, deer and sprawling lawns to sit and have a great picnic. Enjoy Rain dance and water rides at H2O Waterpark  opposite Daulatabad Fort. Visit Quadrangle Cannought Gardens, CIDCO - New Aurangabad for books and allied material on Aurangabad, Ajanta & Ellora. Visit Siddarth Garden with the kids. The sprawling gardens feature a zoo, snake park, lawns, a toy train and junk food outlets. End your dinner the traditional Aurangabadi way - Have Pan at Tara Pan Center, Osmanpura , Aurangabad. Explore one of the seven wonders of India- The Ajanta and Ellora Caves with a local greeter. Also mingle with locals at markets and shops and try the street food. Shop for traditional Indian Khaadi clothing along with pure honey, handicrafts and hand made artifacts and curios made in rural India at the Khaadi Gramodyog Bhandaar at Sarafa, near City Chowk. The Khaadi cloth is hand woven from pure cotton and the outlet is the official outlet of Government Of India. The palace of a local King, 'Deulgaon Raja' has now been converted into the Khaadi Gramodyog Bhandaar. The whole ambiance and the range of products truly evoke the concepts of Khaadi (Cloth made on a Charkha) & Gramodyog (Village based small scale industries) evolved during India's Independence Struggle. The movement was started by Mahatma Gandhi. Worth a visit for foreigners visiting the town. Visit the only organic food market in Aurangabad. Every Friday evening, locals flock to Shree Mangal Karyalaya near Kranti Chowk to buy fresh organic produce and to taste an assortment of organic honey, tea and other processed foods as part of the weekly shopping experience. With a wide selection of fruits and vegetables, the Organic Bazaar is cheap, delicious, unique and definitely is worth a visit. Also, visit the Organic Link - an organic food shop - open all seven days a week at Kailash Market opposite to Padampura fire station, Station Road - Aurangabad. You can visit local bazaars Gul Mandi and Aurangpura' for some essentials. Big Bazar - Aakashwani, Jalna Road. Spencer's Retail - CIDCO, Samarth Nagar, Osmanpura, Ulkanagari. Sapna Super Market - Ulkanagari, Aurangpura, Shahgunj. Cannought Super Market - Cannought Gardens, Tilak Nagar. More - Shahnoorwadi, CIDCO, Pundliknagar. Along with these, there are a number of small time retail shops and grocery shops all around the city. Aurangabad has a fairly good restaurants and eating joints spread across the town. Apart from the star catagory hotels there are many restaurants in the city. Indian Vegetarian(Thaali Meals) 'Thaali' in Marathi & Hindi means a complete meal. Thaali meals consis of assorted Indian breads, varied rice, 2 or 3 vegetables, Munchins, Dals, Kadhi, tradtional cold drinks, Indian desserts, etc. Bhoj, Near Varad Ganesh Mandir is one of the oldest Thaali restaurants in the city. The contents keep on changing daily. The Thaali is neither spicy nor very oily. Recommended and worth a visit even for foreigners visiting the city. Thaat-Baat, off Adalat Road serves a similar kind of Thaali in traditional Indian Silver pottery. The Thaali is a good deal. Naivedya on Jalna Road, is also a good and reputed Thaali restaurant near the Aurangabad Airport and is an ideal place for people visiting or staying around Airport Road. Swad at Osmanpura is another good Thaali restaurant. Indrali at Aurangpura is a good budget Thaali restaurant. mughal darbar-juna bazaar / kat kat gate]]. Non Vegeterian Dhabas (Garden Restaurants & Bars) on outskirts of the city These are Open air/ semi open restaurants on outskirts of the city. They serve good food and liquor. Being a bit far from town they make ideal getaway for families. pasha bhai ka dhaba-daultabad road. Pizza, Coffee, Breakfast, Snacks, Savories, Pastries, etc. Domino's Pizza - City Pride, Opp Gurudwara Gate, Mondha Naka, Jalna Road - is the outlet of the world's no.1 pizza chain. Smokin Joe's - Nirala Bazaar is a pizza chain serving good veg and non-veg pizzas. Korn Klub - Nirala Bazaar serves a large variety of tasty corn products. Cafe Coffee Day - Nirala Bazaar and Jalna Road are the outlets of India's largest coffee chain serving variety of coffees and soft drinks along with savories and pastries. Kream & Krunch - Opposite Aurangpura AMT Bus Stop and at Aakashwani - Jalna Road,Opp to Big bazaar serves excellent non veg & veg sandwiches, savories, pastries, soft drinks, etc. One of the best place for non-veg savories in the city. Baker's Lounge at Osmanpura and CIDCO (opposite Lemontree Hotel)serves mouth watering pastries, cakes (best in town) and excellent veg savories in an elegant contemporary decor. Fast Food Center(Veg) - Nirala Bazaar serves good burgers, sandwiches, savories. Smile, Nirala Bazaar and Laadli, Jalna Road serve good south Indian vegetarian snacks. Cafe Cofee Break at Nirala Bazaar and Cannought Gardens, CIDCO serve good coffees, cold drinks and veg savories at an affordable price. Cafe Coffee Day - at Nirala Bazaar and at CIDCO opposite to Sakaal Newspaper office. You will enjoy various diffrent varieties of coffees. Chimney - Off Jalna Road, Near 7 Hills flyover. City Spice - Cannought Gardens, CIDCO. Residency(Restaurant at Taj) at Ruza Buag, Harsool Road serves excellent Indian, Chinese & Continental food in traditional Mughal decor and cozy ambiance. Society (Restaurant at the Ambassador Ajanta) on Jalna Road evokes the memory of Diwan - E -Aam that was built by the Mughal Emperor Akbar at Fatehpur Sikri. This recently renovated multi - cuisine restaurant serves Indian, Chinese and Continental food. Restaurant at Rama International on Jalna Road serves good multi-cuisine varieties. Relish (Restaurant at the Windsor Castle) Jalgaon Road, CIDCO - Feast on Chinese, continental and Indian culinary delights at Relish Restaurant. There are a number of good road side eateries in the city. Apart from being cheap, they serve hot and tasty food provided you are used to deep fried and medium spicy Indian junk food. Drinking water should be avoided at such places. Gayatri Chaat Bhandaar at Kranti Chowk and Gulmandi are the oldest road side eateries in town. They serve excellent deep fried snacks like Kachoris, Samosas and Bhajjiyas hot and fresh prepared in front of you on a 'Chulha' (clay oven). The places open at 6:30 PM. Bikaner Bhujiyawalla at Kranti Chowk has a snacks counter serving hot & fresh Kachoris, Samosas, Bhajjiyas and Dhoklas. Omkar Pav Bhaji at Kranti Chowk serves good Paav Bhaji. Pav Bhaji originated at Bombay as a quick nourishing meal consisting of Indian bread and mashed & Stir fried mixed vegetables with a dash of butter. A number of road side eateries serve good Indian grilled chicken varieties like Chicken Tikka, Tandoori, Kebabs, etc. at Cannought Gardens, CIDCO. The places usually open at around 8:00 PM and are open till midnight. Vada Paav a traditional Marathi snack, a Maharashtrian version of burger is available at a number of places in town. The Vada Paav at almost all locations is fairly good. But do insist on a hot Vada Paav. Foreigners wanting to try the food from road-side eateries must make sure that it is hot, fried in front of them and must resist from having the non-vegetarian road-side eatables, sauces (chutneys), juices, ice-candies, etc; however tempting may they look! Drinking regular water on streets is strict no no. You must have mineral water. Paan at Tara Paan Centre, Osmanpura is a must have. If you feel how can a 'Paan' be so special then you have to feel a variety of mouth melting Paans with exquisite presentation at this joint. You will not have a Pan like this anywhere in India. Garden Bar (Taj Residency) - Rauza Baug, Harsool Road is a semi-open bar in a sprawling campus of the Taj Residency inspired by Mughal Architecture. The Garbah Bar(The Ambassador Ajanta)The Ambience of Gujarat finds a faithful echo in an inviting appeal in this lovely bar. Slounge (Lemon Tree)- Airport Road, Aurangabad is a contemporary lounge & bar with young and cozy decor along with play-station facilities. Since Aurangabad is a tourist place, the city has a number of good hotels from all the budget categories suiting the needs of all tourists visiting the city. The budget hotels are located near the Aurangabad Railway Station and City Center, The mid range hotels have been distributed over the city and the five-star & four-star hotels are located near the Chikalthana Airport. Lemon Tree Hotel, Aurangabad - R 7/2, Chikalthana, Airport Road, Aurangabad. Aurangabad international dialing code - +91-240-xxxxxxx (Dialing from anywhere in the world except India), 0240-xxxxxxx (Dialing from anywhere in India). Aurangabad city is served by a number of mobile phone operators like BSNL, air-cell, Vodafone, Idea and Airtel for the GSM network. The CDMA network is offered by Reliance, Tata Indicom and Virgin Mobile. Public Telephone booths offering International, Domestic & Local calls are scattered throughout the city. The fare is calculated on a digital meter and the payment is done after the call. These booths are much cheaper than hotel phones. Aurangabad is a fairly safe place. The people in city are by and large decent with the international and domestic tourists. The local buses (AMT & MSRTC) are very safe for women even at late night. If a lady is traveling alone on an overnight bus from Aurangabad usually the seat next to her is given only to a lady traveler as a courtesy but make sure to request for a 'ladies-seat' while making your bookings. Walking on the streets up to 9:00 PM is usually safe for women but avoid going into small lanes and by-lanes after it is dark and make sure that you are not wearing any jewelry while walking on the streets. Women are not recommended to take lifts from private vehicles at any time of the day. Be careful with your cash in public and beware of pick-pockets at crowded locations like Railway Stations, Bus Stations, Bazzars etc. Violent crime in Aurangabad is very low though not negligible. Please have the following numbers with you all the time. They can be dialed from any mobile or fixed line phone. Shirdi - Famous for the Temple of Sai-Baba, a renowned noble Indian Saint. Shani-Shingnapur is an important place dedicated to Lord SHANI (PLANET SATURN) from the Hindu Mythology. Aurangabad is linked by national highways and state highways to all parts of the country. Aurangabad has excellent road connectivity to all important cities in Maharashtra namely Mumbai, Nagpur, Pune, Nasik etc. The excellent road connections make the journey to the world famous destinations of Ajanta and Ellora very comfortable. To Mumbai - Mumbai can be reached by road from Aurangabad via Pune or Nasik. The best option if you can not afford flights is train though. Via road Pune is a faster option despite a bit longer distance. MSRTC (Maharashtra State Road Transport Corporation) and private buses ply regularly and is an overnight journey. MSRTC operates their premium Shivneri Air-conditioned Volvo bus service on this route. A few recommended private buses would be Royal Cars(AC), Konduskar(AC), Ghatge Patil-Snozzer (AC Sleeper), Humsafar (Non AC budget carrier). Book your tickets only from authorized travel agents. To Pune if you do not wish to drive then the safest and most reliable option is an MSRTC (Maharashtra State Road Transport Corporation) Shivneri, an Air-conditioned Volvo bus service departing every hour from Aurangabad Central Bus Stand starting from early morning 6.00 AM till late night up to 1.00 AM. For budget travellers, semi luxury bus service - Asiad departing every half an hour from Aurangabad Central Bus Stand starting from early morning 5.00 AM till late night up to 1.00 AM is a good option. Avoid taking Air-conditioned and Non Air-conditioned private Buses. They never leave and reach on time! To Nasik there is a similar Asiad bus service of MSRTC (Maharashtra State Road Transport Corporation) with semi luxury Asiad buses available every hour departing from Aurangabad Central Bus Stand (CBS). To Nagpur There is good road connectivity. If you are traveling by bus, it will take you a bit more than 12 hours. MSRTC (Maharashtra State Road Transport Corporation) operates semi luxury - Asiad and ordinary buses to Nagpur. Private AC Volvo and Non AC luxury buses are also available on local basis. Good carriers include Prasanna(AC), Saini(AC) and Saini(Non AC budget carrier). The Maharshtra State Roaad Transport Corporation (MSRTC) buses are available at the Aurangabad Central bus stand (CBS). Tickets can either be reserved at the counters on the Central bus stand or bought after boarding from the bus conductor. MSRTC buses run to almost every town and village in Maharashtra state.Saibaba Travels on Jalna Road and Manmandir Travels in Adalat Road and Wonder Travels in Jalna Road and near the Railway Station has facilities to book private bus tickets to Hyderabad, Indore, Mumbai, Nagpur, Nasik and Pune. This page was last edited on 20 April 2019, at 14:16.